Pioneers in the industry, we offer hgm6110k genset controller, hgm6120k genset controller, hgm6110u genset controller and hgm6120u genset controller from India. 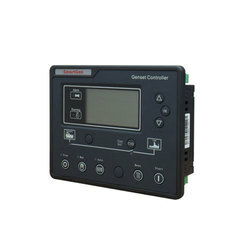 HGM6100U series automatic controller, integrating digital, intelligent and network techniques, is used for automatic control and monitoring system of genset. It can carry out functions of automatic start/stop, data measurement, alarm protection and three “remote” (remote control, remote measure and remote communication). The controller uses LCD display, optional display interface including Chinese, English, Spanish and Russian with easy and reliable operation. 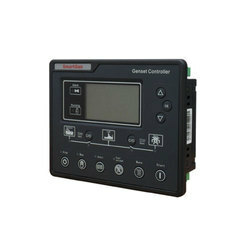 HGM6100U series automatic controller uses micro-processing technique which can achieve precision measurement, value adjustment, timing and threshold setting etc.. All the parameters can be configured from front panel or use programmable interface (or RS485 interface) to adjust via PC. It can be widely used in all types of automatic control system for its compact structure, simple connections and high reliability. 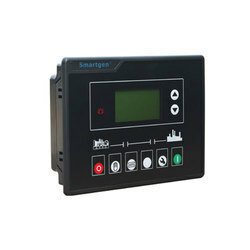 HGM6120U/6120UC: Based on HGM6110U/6110UC, it adds mains AC monitoring and mains/generator automatic switching control (AMF), especially suitable for the automation system composed by mains and genset. Note1: HGM6110UC/6120UC has RS485 port, HGM6110U/6120U without. Note2: HGM6110UC/6120UC is taken as an example to describe in this manual. Parameter setting: Allow user to modify setting and store them in internal FLASH memory. The parameters cannot be lost even when power off. All of parameters can be set not only from the front panel, but also use programmable interface (or PS485 interface) to adjust them via PC. Modular design, flame-retardant ABS shell, embedded mounting, compact structure and easy installation.